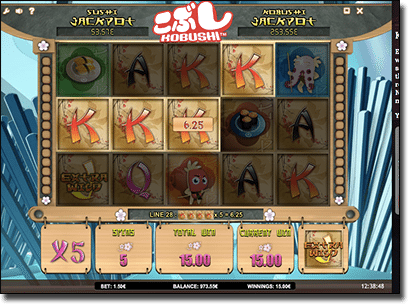 At first, this slot may appear to have a unique and original theme, but it is actually based on the ABC television series, Kobushi. The show is set in a Japanese restaurant, after hours, where the sushi, maki, and temaki come alive, each with their own character, to form a group collectively known as the Kobushis. They all band together to fight the evil porcelain cat who wants to eat them all. While it is quite an odd show to base a slot on, iSoftBet have done a great job with the graphics and getting the theme right – but is it worth our real money wagers? With over 100 episodes of Kobushi created, iSoftBet actually had a lot to live up to when creating this 5 reel and 30 payline slot. Like many of iSoftBet’s slots, Kobushi features a progressive jackpot, which isn’t as large Mega Moolah and Mega Fortune jackpots, and requires quite a large maximum bet per spin to potentially be won. There is a calming Japanese soundtrack to match, with a gong-like sound on a win. You can mute this in the top left hand corner. iSoftBet has stayed true to the cartoon and included the main characters Ebi the Stinky Shrimp-sushi, Toro the Bluefin Tuna, Tamago the Omelet-Sushi, Tako the Octopus Sushi and Shake the Salmon-sushi. These are all the middle paying symbols as well as two plates of sushi. The traditional A, K, Q, and J symbols have also been included each designed with a Japanese edge, and act as the lower paying symbols. Wild symbol: The green ninja character is the Wild symbol and replaces every symbol except for the Scatter and Bonus symbols to complete a winning payline. Scatter symbol: The Scatter symbol is the piece of Nigiri, which is raw fish across a ball of rice. Three Scatters see a multiplier of 5x, four see a multiplier of 10x, and five see a multiplier of 25x applied to your initial bet. Bonus symbols: There are two Bonus symbols one being the porcelain Big Cat symbol which activates the Big Cat Bonus round, and the other is the Kobushi slot logo which activates the Kobushi bonus round. There are a number of bonus features available to activate on Kobushi. Three of more Kobushi Bonus symbols will trigger the Kobushi Bonus Round where you can pick the symbols to score cash prizes up until you reveal a cat (this ends the bonus round). The first two reveals are guaranteed wins. Additionally, this is where you can win the progressive jackpots – the Sushi jackpot or the Kobushi jackpot, with the latter jackpot larger then the former. You do need to be playing the maximum bet for these symbols to be included. If you don’t reveal the progressive symbols, or don’t play the maximum bet, you will still receive a cash prize, with the total value multiplied by your bet. Instead of Scatter symbols activating the Free Spins feature, the Big Cat Bonus Symbols do instead, with at least three taking you to a Pick Me style game where you pick a random number of spins – from five to 20, and a multiplier. Additionally, an extra Wild symbol is added – a randomly chosen symbol from the base game – and can substitute for all symbols except the Scatter, Big Cat Bonus symbol, and Wild symbol. What’s more, there is an Extending Wild added to the middle reel for the whole Free Spins Bonus. 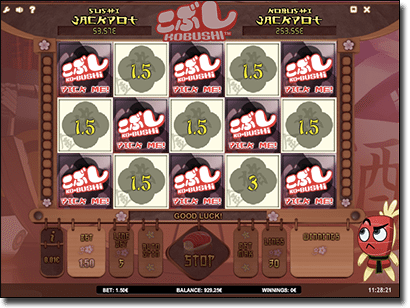 As we mentioned in the Kobushi bonus, there are two jackpots available to win, each created due to a percentage of every player’s bet being added. You can only win them in the Kobushi Bonus round and you do need to be playing the maximum bet. iSoftBet have optimised Kobushi for smartphones and tablets, so if you prefer to play on your Apple iPhone or iPad, Android tablet or phone, or other portable device you can. Simply tap on our links via your mobile browser – Safari and Chrome are both compatible – to find Kobushi in the casino’s mobile catalogue. There are quite a number of symbols on this slot, and their functions can be quite confusing but once we got in the swing of things we realised it was a standard video slot with two small progressive jackpots attached. The Pick Me Bonus is fun, until you pick a cat that is, but the potential chance of picking a symbol for the progressive so easily, is quite fun. However, the fact you need to be playing the maximum bet of $150 when the Pick Me Bonus is activated, is quite expensive and almost not worth the jackpot on offer – at the time of writing the largest jackpot was only worth $253.55. When we finally triggered the Big Cat Bonus we managed to pick six free spins with a 5x multiplier and the J symbol as the Extra Wild, which made for a lot of fun. Other than that the slot is graphically beautiful – as per all iSoftBet slots – and quite entertaining if you aren’t after the jackpots on offer. Since Kobushi has been optimised for mobile devices, as well as desktops and laptops, we recommend playing at any of the leading casino sites in our recommended table above. Use our table to read detailed reviews of each casino or sign up to get a new player welcome bonus.